AshleyNewell.me: RCC10 Paper Piecing With Jessie! RCC10 Paper Piecing With Jessie! Hi friends! I hope you had a great 4th of July! It was HOT here! :) Guess that's what summer is all about! I'm on this week for the Ribbon Carousel Challenge. 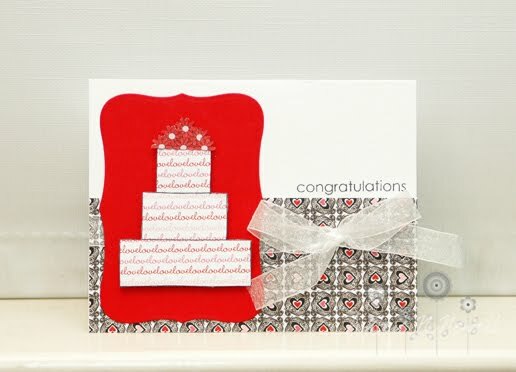 This week's theme is Paper Piecing and our hostess is the lovely Jessie Knight Rone who I LOVE LOVE LOVE. :D And just like Jessie, I love paper piecing! So, this challenge was an easy peasy one for me. Just remember, anytime you play along with the Ribbon Carousel Challenge you need to use ribbon, twine, trim, lace, or something that comes on a spool! Here's my card for this week. I used Mint Motif Cake Shoppe and Cake Shoppe Too. I used sheer ribbon as my spool element. The paper is Bo Bunny. 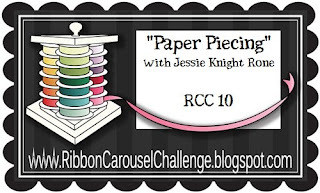 Please go to the Ribbon Carousel Challenge to read up on the rules and link up your creations! Fun! I love the papers you used! Oh my goodness this is so awesome! I love it girl! !